Sara Daleiden has rejoined the Milwaukee Artist Resource Network (MARN) board, following her last cycle from 2012-2014. She is excited to collaborate with board president Mal Montoya and the current board. Sara has a deep attachment to MARN since being an emerging artist in Milwaukee in the early 2000s when several of her collaborators at the time formed the non-profit. She has benefited from MARN as a network since then and has partnered with MARN on a number of MKE<->LAX initiatives over the ten years since she founded and has been directing the agency. Her intention is to collaborate on growing MARN as a network, focused on artists in Milwaukee while also growing an arts market in the region. Sara will focus on strategic partnerships, fundraising, consulting and advocacy with statewide and regional partners. This includes partners such as Milwaukee Arts Board, Wisconsin Arts Board, Arts Wisconsin, Greater Milwaukee Committee, WWBIC, Greater Together, Chicago Artist Coalition, and Imagine MKE, as well as an ever-expanding list of artists and other cultural leaders she values within the region. Sara will seek alignment with MARN and current MKE<->LAX collaborative initiatives like HomeWorks: Bronzeville, Designing Equity and Beerline Trail Neighborhood Development Project. Sara invites you to join her in celebrating at the upcoming MARN fundraiser. She will be renewing my membership at this event and welcomes having you support MARN along with her in whichever way is comfortable for you! A mix & mingle fundraiser to benefit MARN programs. Festivities include creation of a public art piece to be donated to local charities. Raffle plus prizes and more. Admission includes refreshments & silent disco. Milwaukee-based Shepherd Express article called The Economic Case for Public Art released today. Business Improvement Districts are investing in art, but what’s the return? Sara Daleiden is quoted around committing to evaluation of public art from her work with business improvement districts, community development corporations (CDCs), government bodies and other arts partners in Milwaukee and Los Angeles. 1) 2019 Artist-in-Residence for Gathering Art, Stories and Place at Milwaukee Public Library Mitchell Street Branch: RFQ due October 21 through AWE. Please contact Katie Loughmiller at KMLough…at…milwaukee.gov or John Kowalczyk at john…at…awe-inc.org with any questions. Artists Working in Education, Inc. in collaboration with Milwaukee Public Library Mitchell Street Branch as a part of the Gathering Art, Stories and Place NEA Our Town grant, is seeking an artist-in-residence to work collaboratively with teens, community members, and neighborhood experts to create two temporary public art installations and one permanent public art installation throughout 2019 that directly engages and benefits the Historic Mitchell Street Neighborhood. 2) MARNsalon with Nate Pyper: I believe the application is still open today and if you can’t make that deadline, please feel free to reach out to program coordinator Monica Miller directly as she may still be willing to consider your practice for critique or a roundtable next week. Monica’s email is monicajoymiller…at…gmail.com. Nate Pyper is an alphabet artist working in publishing, performance, and video. He maintains an ongoing research practice on queer anarcho-punk zines of the late 80s and early 90s. He is a 2018 graduate of the Yale School of Art. Nate’s purview statement as visiting critic is engaging with literacy as a tool for collective liberation and individual autonomy. He references a critical pedagogy theorist who has been a major influence on Sara: Paolo Freire. Below please find information below about an RFQ for mural artwork (also called environmental graphics) in the Jefferson Street Tunnel in Downtown Milwaukee. The budget is $25,000 for this 2018 project and the submission deadline is this Friday, June 15. Sara Daleiden is a member of the Milwaukee Downtown BID’s Placemaking Taskforce that helped form this opportunity and will be involved with the artist selection process. We are excited about the leadership the BID is taking with public art, creative placemaking, creative entrepreneurship and other related efforts to affect the city experience on and off Wisconsin Avenue. Please contact Gabriel Yeager with any questions. If the deadline is challenging for you and you are interested, please reach out to him to explore alternative arrangements for submission. MKE<->LAX collaboration in terms of residency is possible for this opportunity if you are coming from outside Milwaukee, and Sara Daleiden will be available for advising during the project. On Wednesday, May 30, 2018 at 12:00 PM (CST), Milwaukee Downtown, BID #21 released a public Request for Qualifications for a new public art project located in the Jefferson Street Tunnel underneath the I-794 overpass. The project will enliven a key pedestrian connection between the Central Business District and Historic Third Ward. To view the full RFQ, please click here. The deadline for submissions to this Request for Qualifications is Friday, June 15, 2018 and must be emailed to Gabriel Yeager at gyeager@milwaukeedowntown.com by 5:00 PM (CST). All questions related to this RFQ must be directed to Gabriel Yeager at gyeager@milwaukeedowntown.com and submitted by Friday, June 8, 2018 at 5:00 PM CST. Thank you for your interest in Milwaukee’s growing street art scene! We are excited to review your submission to this RFQ. Maryam Hosseinzadeh (LAX), Lewis Lee (MKE) and MKE<->LAX whipped up this “pop-up” screening for Portals in Los Angeles and Milwaukee. 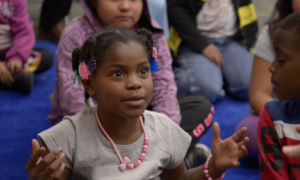 We are screening the short version of the Civic Art: Four Stories from South Los Angeles documentary made by Mark Escribano and Sara Daleiden. Sara Daleiden will be present at Mercado to discuss the film. 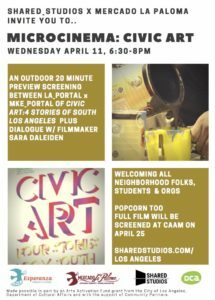 Lake Effect’s Maayan Silver interviews Sara Daleiden, producer of the documentary “Civic Art: Four Stories from South Los Angeles,” and Stacy Williams-Ng, muralist with Wallpapered City and program director for Black Cat Alley on Milwaukee’s East Side. Lake Effect is a weekly program of Milwaukee Public Radio (WUWM).